That's the title I finally came up with for our end of the year Elementary Voicethread project. Around January I asked on Twitter if anyone would be willing to collaborate with an area school using Voicethread. I received a couple tweets back and said I'd be back in touch later. A few things came up and we didn't look to go much further, but Brian Wasson sent a follow up tweet about a Kindergarten class on Long Island still interested, then right before the Spring Break I found another area Kindergarten teacher, where I work, who said she'd be interested as well. I told them that we'd talk after the Spring Break. Well, that Sunday before we came back, I was in church (where I get many of these ideas) and thought, why not invite the world? I created this wiki on Sunday afternoon and by Wednesday we had almost 40 members join our wiki after a few tweets (OK, quite a few tweets) and the project posted in CAPSpace. I left it wide open so people didn't even have to actually join the wiki, so I wonder how many others were interested? I put up the ClustrMap a little late, mostly from US, but a couple from across the pond and on our 1st Grade page you can see a variety from Canada, the US and Australia! 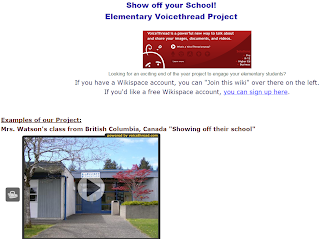 We started with most teachers posting Voicethreads that they've done this year with their class which has been great to see and I hope to post to Colete Cassinelli's Voicethread4Education wiki. However, to keep it to the "Show off Your School" theme, I moved them to this page. Teachers could take just one picture of the front of your school (or classroom) and have all of their students comment on just that one picture if they wanted, or they could do a bunch of pictures. We 'officially' ended on June 3rd and got quite a few in the Kindergarten-3rd grade level. One at the Pre-K and 4th grade level, but none at 5th and 6th. Honestly, I was hoping to get other schools in to look at what others schools did and maybe....just maybe, connect with them at the end of the year. If that happened and they saw how easy it was, then they may look into doing it again next year. We'll see how any of that plays out. I'm hoping to hear ideas to help improve it for next year and to bring in new teachers! I think, sometime in late August, I may move all of these to a 'Spring 2010' page. I will still keep them separated by grades and then start it again next year for a Kick-Off to the school year. Ironically, the Hinsdale teacher and Long Island teacher (Brian's lovely wife who helped their Kindergarten class set up) shared the Voicethreads they made separately. I wonder if that would've been a better way to approach it? Let people sign up, then pair them with another school. The whole posting to a wiki for the world to see, might've been a little scary for some? Then again, I like sharing them on a wiki, teach them how to create and post a digital story on the internet responsibly....for some reason that feels like it should be part of my job?!?! Thanks to anyone who participated. I'd love feedback. I think they went well. Have a great rest of the school year (or summer vaction for some of you not in New York State! ).